Plant cells are different from animals in many ways. The biggest difference is that the cells are larger than those of animals. The cells are also encompassed by a wall constructed from cellulose. 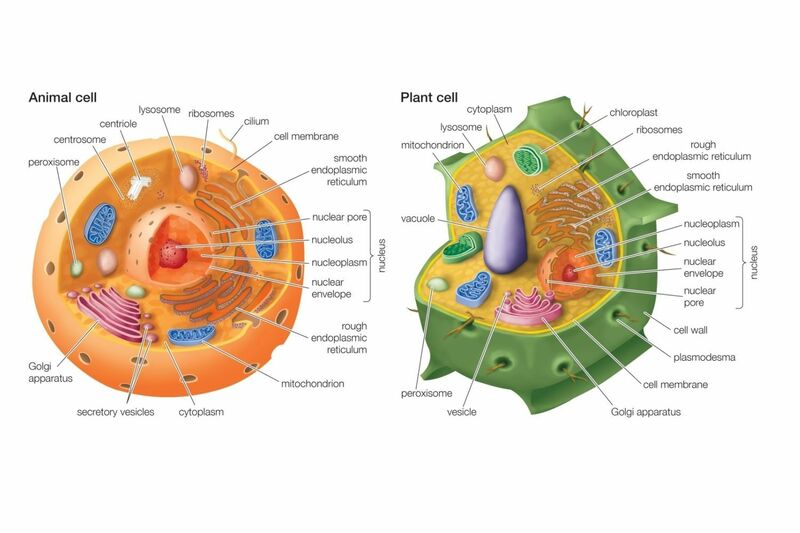 The central vacuole occupies most of the cell and they also have chloroplasts if photosynthesis will take place. The cell structure will vary in plants, but most have three kinds of tissues: surface, fundamental and vascular. These tissues are comprised of different types of cells. The surface tissue (the epidermis) makes up the outer protective layer covering up the plant. This tissue is usually only a cell thick. But if the plant is in a dry environment it will be thicker. This will give it protection and conserve water. It is constructed of epidermal cells which contain the vacuole. The cell wall that looks at the outside of the plant is thicker compared to the wall facing inwards. The epidermal cells at the leaves can function as guards. These guard cells will oversee the closing and opening of the stomata. The stomata are the holes in the leaves. What the guard cells are doing is regulate the flow of gas in and out. The role of these cells at the roots is to soak in the water from the soil. To expand the surface area, the epidermal cells manufacture filaments. The simple or fundamental tissues are made of a single cell type. It is typically clustered according to the wall thickness. There are many kinds of fundamental tissues such as sclerenchyma, collenchymas and parenchyma. Parenchyma is made of parenchyma plant cells, and they are found in the leaves, stems and roots. These cells are highly specialized and have big vacuoles. The cell wall is rather thin. The chloroplasts are contained in the parenchyma cells. The chloroplasts are the elements that provide the plants their green color. It is also what allows photosynthesis to happen. The collenchyma cells are longer compared to parenchyma cells and have thicker walls. Their function is to assist young plants. The sclerenchyma cells also give support for new plants. These cells are among the most specialized of all cells and have a secondary wall to fortify the plant. These cells usually expire at maturity. The vascular tissues on the other hand, are more intricate tissues made of more than one cell type. Vascular tissues come in two types: phloem and xylem. Xylem is comprised of two parenchyma cells and a couple of specialized cells known as tracheids. The tracheids and the vessel elements provide assistance for the plant and carry water up from the roots to other areas in the plant that require it. Phloem is constructed from sclerenchyma and parenchyma cells. They also have companion and sieve tube cells. They transfer material throughout the plant. A plant is a highly complex organism and nowhere is this more apparent than in the types of plant cells that make them up. The cells do everything from guarding the plant to providing nourishment, making them one of the true marvels of nature.